Parmesan crusted bacon tater skins! 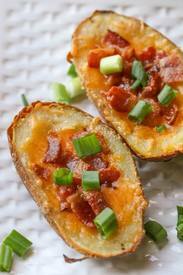 Let me just start by saying, I love potato skins. They are my favorite go to bar snack. Salty Bacon, melty cheese and crispy skins...with a cold beer. Yup, I am sold. I love the recipe from Lil Luna, because the parmesan crusted potato skin is EXTRA crispy (soggy skins are a big let down!). This easy appetizer is filled with butter, cheese and bacon and is perfect for your next party!